All week we have been discussing avoiding and dealing with people who bring senseless drama and negativity into our lives. This post I would like to deal with a specific argument that has gone on far too long in my opinion. The specific argument I am referring to is who created the world. I understand that this is part of many spiritual beliefs. I am neither telling you what to believe or that what you believe is not important. What I am saying is that it is not an argument worth having. Whether you believe in the Big Bang theory, God creating the universe in 7 days or a host of other options that is all well and good. The world is here now, it exists. Arguing about who created it will accomplish nothing. It will not change the minds of those who think differently than you. That is perfectly fine. Let them believe what they believe just as they should let you believe what you believe. What your belief on who created the world does NOT change is the responsibility of taking care of it. There are many individuals who are focused on dividing people and destroying the world we live in. It is the responsibility of all of us, regardless of our belief, is not to let that happen. We must all work together to help prevent war, strengthen the environment and promote peace and unity among all people. Continuing on our theme of looking at the world in an entirely different way, I present to you the quote in the picture above. To be educated just enough to believe what they have been taught but not enough to question it. I suggest you read that line a few times and really let it soak in. Most of what we have been taught has come from those who were around us when we were growing up. This group could include our family, friends, teachers and others. Let me ask you this question. As well meaning as these folks were in teaching us, could it be that perhaps they had a certain prejudice? Maybe they were just passing down beliefs they had been taught unquestioned? Do you think what may have been correct say 50 years ago, may not be correct anymore? Cigarettes and soda used to be considered ‘health tonics’ in the not so distant past. Doing things because “That’s the way they have always been done” makes as much sense as riding a horse to work instead of your car. I suggest questioning a lot of what you believe. That is not to say it is incorrect. Quite to the contrary. Questioning what you believe can lead to a greater understanding and strengthen your faith in it. I turn to the Dalai Lama for an example. One of the leaders of Tibetan Buddhism, he could have easily just followed tradition and did things the way they had been done for centuries. Instead, he has challenged convention and opened up dialogue with other faiths. He also has questioned his own faith. Instead of accepting the power of his form of meditation, he encouraged scientific study of it. He challenged neuroscientist Dr. Richie Davidson to switch his focus of study from anxiety, depression and fear to study qualities like kindness, compassion and equanimity. He even gave permission to have Buddhist monks studied while they meditated. What he discovered only strengthened his faith. I encourage all of us, myself included, to take a look inside at some of our long-held beliefs and ask why it is we believe them. Perhaps they could use a little tweaking? Perhaps they are totally invalid in light of our own personal experiences. Perhaps, like in the case of the Dalai Lama, by questioning them we will gain an even deeper understanding and appreciation of them. This line of thought when it comes to both gossip and rude people has brought me more peace than almost anything else I do. When you stop and think about it, what other people think about you is really their business. Sometimes you can learn little things you might improve, but generally gossip holds no redeeming value. I recall when one of those ladies I mentioned earlier was concerned as to what people may be saying to me, she could not tell me enough. Again I gave her my same reply, “Don’t know. Don’t care.” She asked how I could not be concerned as to what people whispered behind my back.. The answer is easy, if they are doing it behind my back, then that is where I leave it – behind me. If those I love and care about have some concern with me and tell it to me personally, I definitely would take the time to discuss it with them. Otherwise, it is not worth the energy and feelings to worry about. As far as rude, critical, and argumentative people the answer is the same. On one of the Apps I share my positivity on a gentleman became enraged with me. As he continued to place one comment after another on my post becoming more and more angry I did my best to explain that being upset about my writing was not doing him any good. I even suggested he ‘mute’ me on that site so he would not have to see my posts which obviously upset him. He continued throughout the evening to comment and work himself up. He even continued by posting about it the next day. The funny thing about all of this is what he was upset about – my title was in all capital letters. He thought that should be reserved for emergencies, which was his right. My title was 6 letters long. It included the word ‘I’ which should be capitalized as well as the first letter of the title. So, this man was angry for 2 whole days over 4 letters being capitalized. Margie, in her sweet loving way, always wishes to go online and defend me to these people. Again, I remind her that it really doesn’t matter. The majority of people appreciate what I write and enjoy the content. In fact, in six years, over several social media platforms as well as print there has never been one person to be upset that my title was in all capitals. That is saying quite a bit as I am followed in over 100 countries by over 20,000 people, not to mention the casual viewer. This man certainly had a right to his opinion. By him getting so upset the only person he really hurt was himself. Buddha had a great quote about anger. Anger, like worry, causes the release of acid in the system. Have you ever worried so much you actually started to feel sick to your stomach? Same with anger. Your blood pressure rises, your heart rate increases and your breathing becomes shallow. All of those have negative impacts on your immune system as well as your overall feeling of well-being. You must ask yourself, “Is this worth getting upset over?” I can promise you the answer 9 times out of 10 will be a resounding ‘no’. Do yourself a favor. If you are working to be the best person you can and do the best you can, do not waste an ounce of energy on what other people may be saying. If someone approaches you to tell you all about what this person or that person is doing or saying I suggest giving them my response – “I don’t know and I don’t care.” Your sense of inner peace will thank you. This is a great litmus test to put our words through. How many times a day do we let something escape our lips that we shouldn’t? Having these 3 questions in mind would help prevent that from happening. Remember you cannot unsay something. How do we keep these questions front and center? Use this picture as your screensaver, pertain jot them down on an index card you carry with you. Then, put it into practice. Try doing this just for a conversation here and there. Eventually, it well become a way of not only speaking, but thinking as well. So you don’t feel too down on yourself when you first try this, allow me to share my experience. I tried this at work and all I can say is “wow!” I never realized how many useless negative things I say there! Even someone who writes positivity for a living! Although a bit taken aback, I was excited. There is so much room for me to improve my conversation skills. Try this yourself. I’m about to meet a friend for coffee and am going to try again. I think you will notice different people bring out different conversations. I would love to hear your experience as well! Desmond Tutu has always been a person I admire. Although strong in his faith, he, along with the Dalai Lama, have put differences aside to work together for the greater good. In this single quote I think the reason they do so is summed up rather nicely. When facing a conflict, the first thing many of us do is run to our friends to vent. Whether that venting is in person, on social media or in some other medium it generally degenerates to gossip and leads to both parties growing further apart on the issue at hand. It also reduces the amount of trust between the two parties. We see examples of this on the world stage between governments. The end result, all too often, results in war. This not only leads to the loss of countless, often innocent, lives, but decades of trust between nations and their people. This also happens on a personal level. Working as a DJ, and as a bartender for years before that, I have seen this happen far too often. These adults have issues with each other, sometimes legitimate, sometimes petty. Rather than act in a solution oriented manner by approaching the person in a non-confrontational manner to discuss their differences, they begin complaining to others, or worse put things out there on social media. This usually results in name calling, and even others joining in and fueling the anger and hate. This also happens on an intimate level. At my day job I have overheard men complain about their wives and girlfriends nagging them, or driving them crazy. I have heard ladies complain their husbands are inattentive and ignorant. What happens? The other party usually agrees with them, maybe even adds a story of their own and both parties leave with an even greater angst for their spouse. When they get home a loving resolution is further away then when they left that morning. Enemies do not always have to be those we are against. As mentioned in the above examples they can be our friends, our coworkers or even those closest to us. No matter how we define those we are in conflict to, it is important to realize the only way to reach a peaceful solution is to confront them in a peaceful manner, while expressing the desire to reach a solution beneficial to all parties. I am not foolish enough to think that this will be easy, solving conflict generally never is. The reward, if we do pursue this path, will be peace. That peace will not only benefit us, but those around us. We cannot control the actions of the governing bodies of the world, but we can set an example for them and for others by rising above the negative and petty. By doing so we will begin to foster a world full of peace and love. 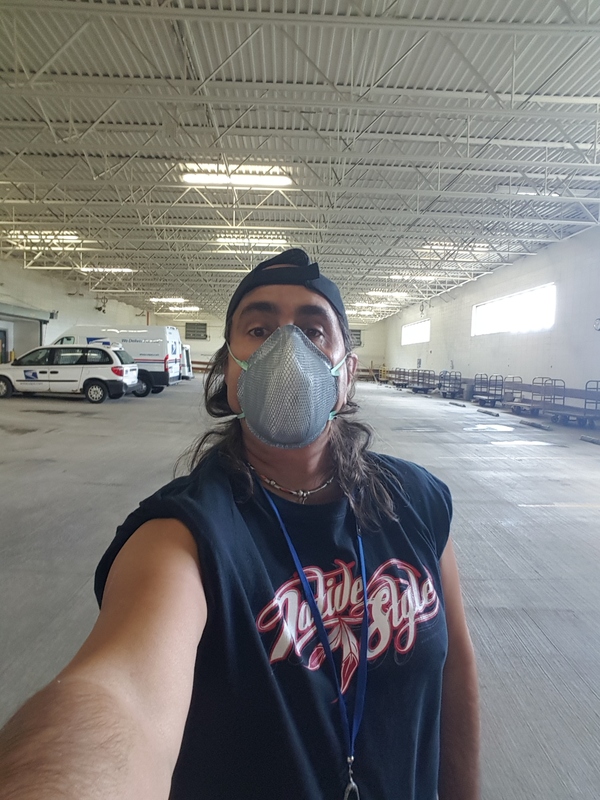 This is me at work about to do some work in the garage. I am about to kick up a lot of dust so I am wearing a dust mask. Initially, I was told by my boss that wearing a mask when you are around dust makes it worse. How this could possibly be true? I am not entirely sure, but I knew that the mask blocks a lot of the bad things I would be breathing in and with my asthma it was a good idea. A trip to the doctor and a note from him saying that yes, wearing a mask to prevent breathing dust is a good idea. What point does this make other than that my place of employment often goes in the face of common sense? Here is what this whole event made me think of. In my everyday world I do my best to protect myself against things that are negative and may drain my positive energy. Sadly, you cannot just buy a ‘negative mask’ and it will block all of the bad things in life. What can you do to protect yourself from these harmful things? Of course you can try limiting your exposure to them, but sometimes that is not entirely possible. Like trying to clean that garage without kicking up any dust. What we need to come up with is a piece of equipment that can protect you. This can be easier than you might think. In my book A Happy Life for Busy People I give you an example of gratitude in your pocket. In a nutshell, it is carrying a talisman of some nature that reminds you of things you have to be thankful for. You can do the same for this. Find something small enough t0 carry in your pocket that reminds you of staying positive. In my book we also mention having a ‘happy playlist’, which is a playlist on your Mp3 player, or I have recently made a list on YouTube so it is always available on my cell phone. Imagine being able to pull your talisman out of your pocket, or listen to that uplifting music right before a stressful meeting at work? Maybe you will be sitting next to people that just spend the day gossiping? Knowing this ahead of time you can get your vibe on a positive level and have a little escape that can keep you motivated. So gather your songs, find your talisman. It doesn’t even have to be something tangible. You can imagine putting on your ‘Superhero suit’ before you walk into that meeting. Maybe it is a powerful cape? Magic earmuffs? You can put them on in your mind and change your mindset. It may sound silly, but taking that second to change your mindset can make all the difference. Feel free to share your ideas for protecting yourself in the comments below. 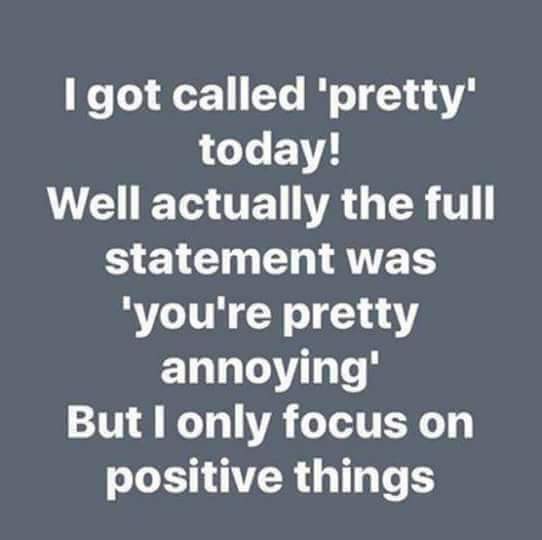 NEVER LET THEM GET YOU DOWN! If all this sounds a little like putting on ‘rose colored glasses’ or looking at the glass as half full, well it is. We must realize the very power in doing just that. Unfortunately, what the world may give us is not 100% in our control. How we react to it, or what we do with it is. If we let insults or situations to hurt us or bring us down, we let those situations win. Frank Sinatra, the famous singer and performer once said “the best revenge is massive success.” That is so true. Let us begin today by taking every negative thing that comes in our life and turning it on its head. It will take some practice, but I promise you will be smiling more and crying less. Not to mention, those cruel souls saying those mean things may give up in frustration.